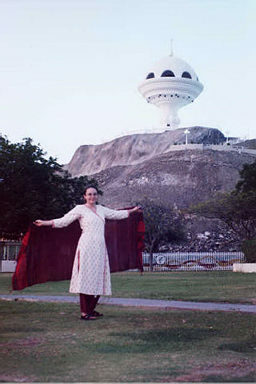 Photo taken May 2001- Oman. Click to see larger size and exotic landscape. This dress is called a Salvaar Kamiz. This is a Hindi word- salvaar means PANT and kamiz means SHIRT or TOP. This dress comes in three pieces- the top, pant, and dupetta (scarf). The dupetta can be worn in several ways- from front to back around both sides of neck, falling on the back, folded in half, folded in pleats, like a sari pallu, worn over one sholder, or over the head to protect from the sun. 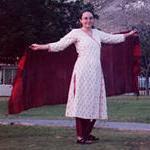 There are two terms for this dress, one is Salvaar Kamiz - SK hereafter- and chudidhar. There is a slight difference. The SK has a pant which is loose at the ankles, and looks normal length when not being worn. 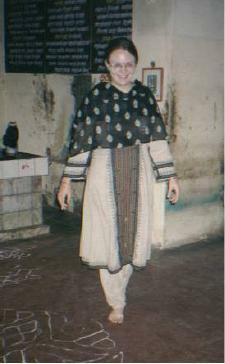 The pant for the chudidhar is very long and tightens at the ankle with a snap or button. The pant seems very long when it is not worn, and when it is worn, it bunches at the ankles. I had a dress like that, but found the pant very uncomfortable, hence I did not keep it. The kamiz for either variety may or may not have a slit on the side. Now a days, even in Chennai, you can see girls wearing slits on both legs up to waist, semi- transparent pant, deep necklines and transparent dupetta. Some western clothes may not be so revealing! I stick to the less modern styles of SK. The Salvaar Kamiz even has an art to wearing it properly. One should not let the salvaar blow up in the wind. Also, when sitting, be sure to cover up all legs and not let any 'peeping inside.' This may seem strange for Indians to read, but for westerns in India, I found out the hard way. It is considered very indecent to let people see inside your salvaar into the pant, especially above the knee (though above the knee kamiz' are becoming fashionable). Westerners usually feel since it is a pant underneath a 'shirt' then it is OK, but it is not considered proper behavior. SK can be purchased ready-made or tailored to your measurements. If it is purchased ready made, be sure to tug a bit on the seams, especially if buying in a bazaar. Sometimes the seams are not so good. If they are not good, you can bargin for a lesser price, and take it to a tailor and spend between Rs40-60 to get it restitched. This will last for up to a year with Indian water condition. ;) If it is purchased stitched, many bazaars have fabric sets for salvaars. Usually these come in pre-packaged sets which can't be changed. You can make your own fabric combinations at some shops. Photo taken November 2001- India. Click to see larger size.